Our 2018 annual show is at the Trinity Methodist Church on Narborough Road, Leicester on Saturday, 2nd. June, 2018. 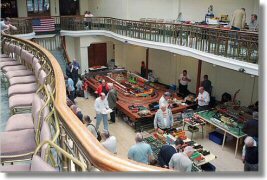 There is usually a good selection of club members displaying a wide range of vintage and new products from the Lionel stable with a smattering of American Flyer and Marx trains when those members are available to attend. The show also has a few stalls selling a variety of new and secondhand equipment. The show starts at 10.30 in the morning, and ends at 16.30. The day is spent running members trains. If visitors bring compatable American 'O' gauge trains. We are happy to give them a run on one of our layouts. In the evening the members have a club meal. After the meal the layouts are run again with the hall lights dimmed down so that the lights from the trains can seen racing around the tracks. A map showing the location of where the show is located can be found here. (powered by Google Maps). We look forward to seeing you there!